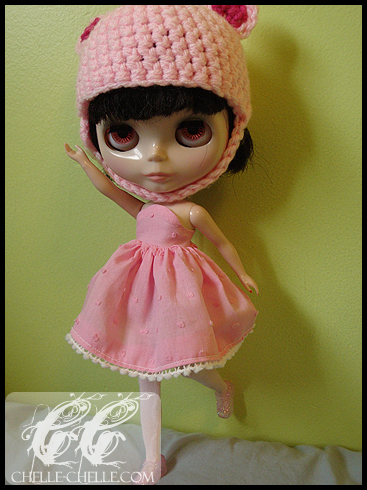 Chelle-Chelle.com – Crochet, Knit, Craft » I sewed things! I finished off the term, but no final grades yet as those aren’t released until the day after the last day of finals. In a way, I’ve found this to be both good and bad. Good in the fact that if you have later exams, you don’t become distracted with obsessively refreshing the page to see if grades are up. Bad because if you’re done early (like I was), you have to wait over a week before final grades are available. Either way, I know that I had at least passed everything and I know I did okay in all of my classes this term. So in lieu of finding a job or going on fancy trips (like some of my friends), I’ve been sewing! All of my crafting lately has been for Blythe – I’ve been using the Doll Coordinate Recipe books that I have as they’re a great resource for patterns. I’ve been on a bit of a sewing kick lately, but I’m sure that’ll switch to knitting soon as I’ve been queuing up a bunch of sock patterns that I want to try and I’ve been crocheting as well and writing down steps as I do them – so patterns will be up in the near future! The first two are from DCR #5, the third is from DCR #1. I did make some adjustments to all three of them. 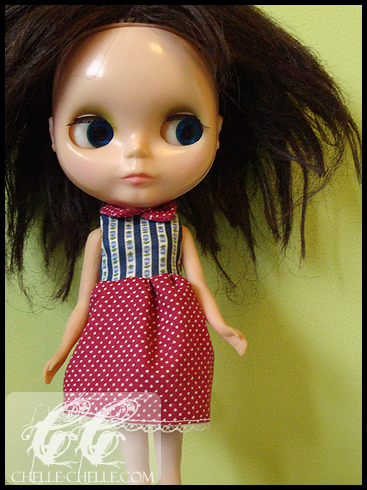 First dress: I added ribbon ties at the bodies to go around the neck. 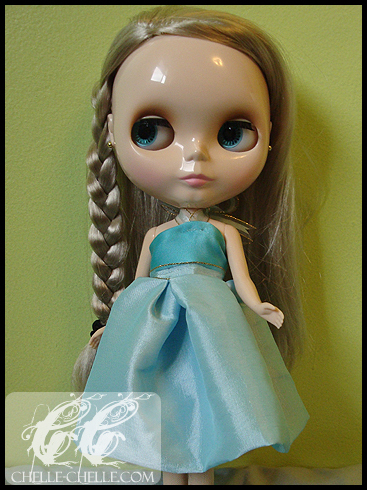 For the second dress, I added a lining because I really didn’t want to clip and turn the arm holes without a lining. I probably could have done it without, but I didn’t want to. For dress number 3, the pattern is actually for a top (think camisole), but I added a longer ‘skirt’ to it to make it into a dress. The ladies be checkin’ out all da boys. Now they just need to wait for the best looking guy to show up before they make their final decisions for the evening. The best looking guy being a certain tall / bald guy who’s flirty with the bride, and totally going to hook up with Brooke. But in all seriousness, moments like this really let the reader connect with the characters and fleshes them out beyond their wrestling personas. I like these moments, dude. Keep ‘em coming! ciao Chiara, dopo aver letto il tuo libro scopro una persona che la pensa in maniera molto…troppo simile a me…. (mi dispiace x te!) e ti ringrazio: ho sempre cercato le parole x dire certe cose, tu le hai espresse come meglio non avrei saputo fare: anke io ODIO i ti LOVVO facili…….x non parlare di quelli miseramente contraddetti dai fatti!!!!! e ti dico una cosa: meglio essere "ORSI" che ipocriti, questo Ã¨ come la vedo io! E FB non c'entra un bel niente!! Kinda speechles…hmmm, well, cool blog-found ya thru Miss Britt- love her take on life and you? Well I’m learning sooo may new things.Wow! But, I don’t scare easily so I’ll be back!Oh and before you waste your time I’m a Mama Blogger ;0. But I’m cute, does that count?